CP: Most of the books that you’ve translated were written by Austrian or Swiss authors. What draws you to those literatures? TL: I am particularly drawn to writing that is deeply rooted in local customs, conventions, institutions, and linguistic and cultural traditions, a counterpart of sorts to the smooth “global” literature that could come from anywhere. As rich, varied, and heady as the bodies of Austrian and Swiss literature are, they are still often seen as marginal to German literature. To me, much of the most exciting and innovative writing in any language takes place on the margins. The Austrians and the Swiss speak and write German differently than Germans do, much as British and American English differ. Trying to convey the inflections and flavors of those variants is a real puzzle and a constant source of joy and despair. CP: One of my favorite passages in One Another describes the loss of the main character’s native Swiss dialect and its replacement with a depersonalized High German: “Since [childhood] I’ve spoken stage German, a language that doesn’t come from anywhere in particular and is at home everywhere, that isn’t familiar or foreign, with clear alternatives and clear limits, imprecise, indifferent to particularities, but useful in general and effective on the whole.” How did you resolve the translation problem posed by dialect in this novel, which takes place in various cities throughout the German-speaking world and in which there are about as many German as Swiss characters? TL: In real life as in fiction, the German you speak, whether high German, a regional variant or a dialect, immediately places you geographically, even socially, with a specificity that most Americans can’t imagine, although the British still can to some extent. For One Another, the publisher of Persea Books, Karen Braziller, and I had considered adding endnotes to explain, for example, what Kaffee Luz is (short for Luzerner Kaffee or Lucerne Coffee, a regional specialty of central Switzerland, prepared by adding a shot of apple and pear brandy to sweetened coffee). But in the end we decided that these cultural markers, like switches between high German and dialect, were clear enough from the context or would require too cumbersome an explanation, so we decided in favor of sustaining the narrative momentum, even if it meant losing such nuances. Another aspect of the novel that caused me many sleepless nights was the frequency and subtlety of Monique’s literary allusions, which usually involved some punning. For example, the title to Chapter 4, “A stranger I will leave” (Fremd ausgezogen), alludes to Franz Schubert’s song cycle, Winterreise, of twenty-four poems by Wilhelm Müller set to music. The cycle opens with the poem Gute Nacht, which begins: “Fremd bin ich eingezogen, / Fremd zieh’ ich wieder aus” or “I came here as a stranger, / A stranger I will leave.” Monique plays on the double meaning of the word ausziehen—to depart or move out and to undress—a double entendre that cannot be captured in English. The allusion is echoed at the end of the chapter when the narrator has a sexual encounter with a man she doesn’t know and she recounts how this stranger undressed her. CP: I’m excited to review your upcoming translation of Walter Benjamin’s The Storyteller. I was surprised that the same person translated both of these books. Do you prefer translating fiction, poetry, or essays? Are there any genres that you haven’t yet translated but would like to, or are there any genres that you would rather avoid? TL: I enjoy translating all three genres. Each has its own challenges, but these challenges always take a back seat to the primary obligation of finding an appropriate voice or style for the particular text. I suppose my favorite genre is fiction because I love getting caught up in the story at first and then finding out how it works sentence by sentence. That said, I’ve been lucky enough to translate essayists, such as Benjamin or the Austrian writer Karl-Markus Gauß, of enormous stylistic sophistication and character. I find translating poetry very intimidating but would still like to do more of it. However, I try to be very clear-eyed about my limitations before committing to projects. I find rhyming very difficult, so would think hard before taking on a collection of rhymed verse. One genre I’d love to translate is drama. I’ve done excerpts and a scene or two here and there, but never an entire play. Translating for the theater is a different animal altogether because to do it right, you need to work with the director and actors to find solutions that work best for each production. I find that collaborative approach very appealing. CP: In 2015, you told Words Without Borders that you have a ritual of reading English-language books that are related to any new translation project that you undertake. Do you still employ that ritual? What English-language books did you read before translating One Another? Which did you read before translating The Storyteller? “art monsters” and on how to overcome betrayal and disappointment in marriage (all of which the narrator of One Another wrestles with). Also, Rachel Cusk’s Outline Trilogy helped keep me attuned to the subtleties of interweaving biography and fiction in novels narrated by writers. Walter Benjamin’s The Storyteller Essays was one of the hardest translations I’ve done yet, not just because Benjamin’s style is both labyrinthine and elegant, but because the collection also includes essays by Montaigne, Paul Valéry, Johann Peter Hebel, Ernst Bloch, and others. I had to adapt my English to each, of course. Most of the reading I did to prepare was by or about Benjamin. I was particularly glad to have the collection of Walter Benjamin’s short stories, The Storyteller: Tales out of Loneliness, published by Verso Books. It was interesting to read Benjamin as a storyteller while translating his thinking about storytelling. Tess Lewis is a writer and translator from French and German. 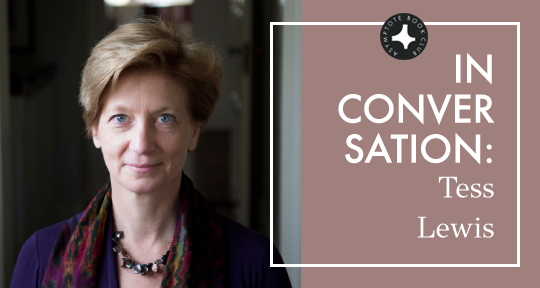 Her translations include works by Christine Angot, Philippe Jaccottet, and Peter Handke. Her recent awards include the 2017 PEN Translation Prize and a Guggenheim Fellowship. She is co-chair of the PEN America Translation Committee and an Advisory Editor for The Hudson Review. Chris Power is an assistant editor at Asymptote who lives in Brooklyn.